Ok.. In this image, EVERYTHING is telling me that black is winning. The suggested move is Nb1 (which I'm highly questioning). Also, you can see that Nb1 only has 188 positions compared to thousands for other candidates. Ok... here is the tree after Nb1 as suggesed by IDeA. In this image, you can see that IDeA only has a valuation on 3 of the 6 candidates, and positions on only 2! And finally, the tree after 13...Bxf3 as suggested by IDeA. How do I proceed? 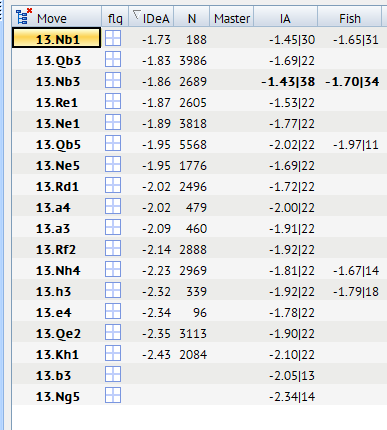 I want to make idea consider and give me valuations and positions on 13.Nb1 forward. I'd RATHER it not create more candidate moves as some of the candidates in the tree are already silly and weak. Is there a way to make IDeA evaluate the existing tree and candidates? At this point, I want depth and not necessarily width... the moves seem pretty forcing for white but I want to consider all options (practicing analysis techniques). Is this a case where I need to go in and manually with IA? If so, how do I get IDeA valuations and positions for these candidates? Please help this newbie out. Well, I think I state the obvious, the position after Nb1 needs more work. There are any number of ways you can do that. Several of been discussed in this forum (thread). Probably one of the simplest things to do would be to add a root node after Nb1... or perhaps someplace later in that line. It is hard to judge without seeing the position. But certainly more work on the Nb1 line needs to be done. IMO. This sort of thing is commonplace with Aquarium. The fact that Nb1 has little analysis done compared to the other candidates probably means that it started life further down in the candidate list and worked it's way up as the other candidates lost ground after more analysis had been accomplished. Without having seen what took place to arrive at this state, it is hard to say exactly, but that is what it looks like to me. Adding a root node after Nb1 would allow 2 things: a) Aquarium would give more analytical power to the Nb1 line, and b) Aquarium would still continue to analyze the original root node, in case some of those candidates rise again (and I have seen that happen often). When examining the downstream moves in a line of play, you should examine all the way to the leaf node in the line, because these imbalances can be anywhere in the line of play - so you can be quite easily fooled by inadequate analysis anywhere along that line. Ok but is there a way to MAKE IDeA consider and evaluate listed candidates that have no evaluations? Make them a root position? Make them green? Some other way? If you want IDeA to evaluate a move, make the move on the board, then hit either "Alternative" or "Custom Task". Either of these will cause IDeA to evaluate a position. And, yes, you can make it a root node too - that would definitely cause IDeA to spend time on that position. I add and subtract root nodes A LOT as I make IDeA consider some position that has not been looked into enough. In fact, that is the nut of my suggestion above, you can always throw in an additional root node and take it out later, after you are satisfied. And, of course, you can combine these actions, i.e. throw in a Custom Task/Alternative, etc, and also make it an additional root node (and add-on IA or Sandbox work). There is no limit to the combinations you can throw at it. Your judgement is the only real limit. Heck, I have been known to throw IA with 6 different engines at a position simultaneously!! Now I don't do that often anymore, but it is a quick way to get a lot of good alternatives. Just a quick note on something that might not be completely intuitive. There is a tree strategy called Root that gets run whenever you create a new root node if a strategy with that name exists in the strategies folder. You can prevent this behavior by deleting or renaming it, or you can choose which specific strategy is used by creating one and naming it Root. Not intuitive at all. Thanks for that. To be honest... I'm gaining a level of frustration. First let me say that I appreciate the help that I have gotten so far. However, I'm seemingly not able to make the program what "I think" I want it to do. I'm getting close to shutting it down and just trying to figure out how to do everything in Chessbase. I mean, if it's good enough for the ICCF World Champion... am I right? Not a threat at all... just venting. back to banging my head against my monitor. Boy you would really have been pulling your hair out a couple of years ago, it has really only been the last 2/3 versions (yearly realise) that it become at least stable. Honestly at this point. If I knew how to thoroughly do my research in Chessbase, I'd just use that (so super frustrated right now). I am trying VERY VERY hard to use this software. I'm sure chessbase is easier to use, and more expensive. AQ2014 has serious issues, but there was an island of relative stability in build 725. From 2016 onward it has been pretty smooth sailing, but I have also adapted to avoid things that caused issues in the past. These may or may not apply to anyone else because there is a dependence on hardware, engines, remote connections, and specific usage. With that disclaimer in place, this is what I recommend to improve stability. Link games to a configuration in the sandbox instead of the database area. You can control IDEA, IA, have notation and tree configuration windows all in the Sandbox. IA can be turned on and off with the little beaker near the top left of the screen, there are also tabs for the tree and idea. Other people here link their games to the database section, but that caused massive problems for me in AQ2014 so I stopped doing it and never looked back. Use Hugebase instead of Mega database. Most if not all of the issues I have experienced with databases came from trying to use Mega Database in Aquarium or Chess Assistant. Be careful not to over allocate your memory. Running 6 engines with 1 GB assigned to each on a computer that only has 4 GB of RAM will cause serious problems. Don't run more engines than you have (cores-1) on the computer that is running Aquarium. It is OK to count hyperthreading as full cores for this purpose, so if you have a typical quad core intel computer with hyperthreading then don't run more than 7 engine "threads" at a time in any combination of engines. Remote computers can run a number of engine threads equal to their full core count including hyperthreading. A typical way this can happen is to assign IDEA the maximum reasonable number of engine threads and then run IA on top of that. Make sure you don't assign a given port to more than one remote engine. Be careful where you send positions to from the database or IA. It is very easy to accidentally send those positions to the previous project you were working on. Don't try to analyze more than 3,000 positions per hour. Plunk down the cash for Chessbase and be done with it. Probably fine for winning ICCF games if they can even be won anymore, and you get a nice picture of Fabiano to look at while going over the candidate match games. I already have Chessbase 14... I've had it for a while now. I've never used engines in the way that I'm trying to use them now. So I'm trying to figure out HOW to do this. Of course, getting workflow tips is pretty difficult as folks seem to want to hold their cards close to the vest, so to speak. So I apologize for my frustrations. I am much more familiar with the operation of CB. But not how to do what I'm trying to do with these ICCF games. I've heard the recommendations on Aquarium for this. That's why I bought it. I'm just struggling to work out a detailed workflow. I'm still here and open for suggestions and help. "Be careful not to over allocate your memory. Running 6 engines with 1 GB assigned to each on a computer that only has 4 GB of RAM will cause serious problems." Where would I allocate memory? I've not chosen anything in the way of memory. I have 16GB. Are you talking about the HASH in the engine setup? I do only have a quad core i5-6402p... which, as far as I know, doesn't have hyperthreading. So I am limited to those 4 cores. What SHOULD I assign in the way of RAM? You need more computer power. My personal rig, assembled by my son Mark, is currently using an AMD Ryzen 7 1700X, which has 8 physical cores and hyper-threading. It is the best computer I have ever used. It is what allows me to work on multiple things at the same time. With only 4 cores and no hyper-threading, you are severely limited. For years before I upgraded to Ryzen, I had an i7-920, 4 cores with hyper-threading, and I always felt stymied by the lack of computer resources. I told my wife, if I can get into the Candidates for the WCCC, I am upgrading again to an AMD 1950X (or better), 16 cores with hyper-threading. She said okay, but it will be tough to qualify for the Candidates. Basically, in my opinion, the more cores/threads you can run, the better. NO question I need more... Unfortunately, it'll be some time before that can happen. Fortunately, I have a LOT of time to put into this so I can compensate 'somewhat'. It does not have to be either/or. I use both Chessbase and Aquarium. Sometimes at the same time... in fact most positions I analyze, I work both thru Chessbase and Aquarium side-by-side. I find they work well that way. I started out with Chessbase, so it is a natural for me, I came to Aquarium only after I was already >1900 elo, and wanted something to boost me a bit higher. A fellow ICCF player (in the old ICCF forum) recommended Aquarium, he was >2300 at that time, and I gave it a try. Since then, he is >2400 and I am just a bit shy of 2400. I would not give up my Chessbase. Well, it is understandable. IDeA is a feature with a lot of things to explore (I should do marketing :-) ). Still, if you try to do the same with Chessbase, good luck :-) You just can't do that. Chessbase is a database software, Aquarium kind of an analysis software. You can use each for the other part, too, but it's limited then. Yes, I have removed the root file (renamed it so it doesn't run). Honestly, I don't use any of the strategy scripts at all. When they first came out I played with them, but found them not much better, and a lot more time consuming, than regular Custom Tasks. OK call me dense. But what is the difference between the Tree Generation Strategies and 'regular custom tasks'. Can you elaborate? I guess you have to understand that I started with Aquarium before we had the strategy scripts. So to me a regular Custom Task is the old style Custom Task... where there is no script you can change. To use the old style, just uncheck "Use prolongation strategy", then specify the number of alternatives and quality of analysis -- it is much faster, but maybe not as good as the strategy scripts. "then specify the number of alternatives and quality of analysis"
OK.. I can setup the quality of analysis in the project setup... where are you setting number of alternatives after unchecking auto prolongation? Ive read that.. But he just said he isn't using those. So I'm asking how he's setting the number of alternatives without using the TGS. I am describing options available within the Custom Task dialog box. When you press Custom Task, uncheck "Use prolongation strategy" and then you can set the other parameters, right there in the Custom Task dialog box. Ahh that makes sense.. I understand now.. Thank you Pawnslinger.